Thyroid ophthalmopathy is currently is recognized as the most common cause of proptosis (protrusion of the globe) in adults (see the first image below). Other clinical features include upper and/or lower eyelid retraction (see the second image below), restrictive myopathy causing diplopia (double vision), compressive optic neuropathy, and exposure keratopathy. Although most patients are clinically hyperthyroid, signs of thyroid ophthalmopathy can be present regardless of thyroid function. Severe proptosis and eyelid retraction from thyroid-related orbitopathy. This patient also had optic nerve dysfunction from thyroid-related orbitopathy. 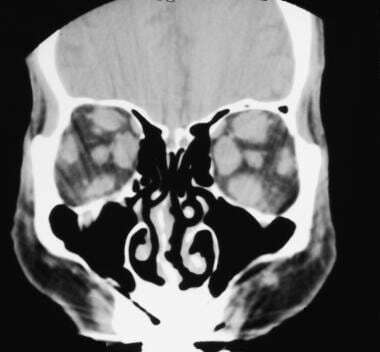 Although this patient had mild proptosis, there was also prominent eyelid retraction with temporal flare on the left. MRI axial section of the orbit. Note the enlargement of the muscle bellies that spare the tendinous insertion on the globe. MRI axial section demonstrates enlarged inferior rectus muscles. 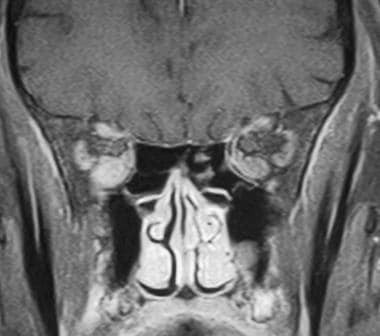 MRI coronal section of the same patient as in the previous image. The extraocular muscle bellies, especially the inferior rectus muscle on the right, are enlarged. MRI coronal section deeper in the orbit near the apex demonstrates crowding of the optic nerve by the enlarged extraocular muscles. 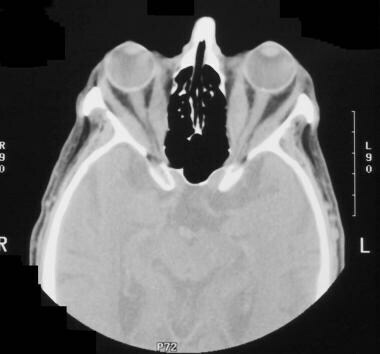 Computed tomography (CT) scanning is also an excellent imaging modality for the diagnosis of thyroid ophthalmopathy (see the following images). In addition to allowing visualization of the enlarged extraocular muscles, CT scans provide the surgeon with depictions of the bony anatomy of the orbit when an orbital decompression is required. Computed tomography axial image demonstrates the enlarged bellies of the extraocular muscle without involvement of the tendinous insertion to the globe. Computed tomography coronal section through the orbit demonstrates enlargement of multiple muscles within the orbit. Prominent intraconal fat can also result in proptosis and straightening of the optic nerve. In addition, this patient has mild enlargement of the extraocular muscles. Orbital ultrasonography can be a convenient examination for the diagnosis of thyroid ophthalmopathy, because it can be performed quickly and with a high degree of confidence. High reflectivity and enlargement of the extraocular muscles are assessed easily (see the images below), and serial ultrasonographic examinations can also be used to assess progression or stability of the ophthalmopathy. B-scan ultrasonogram reveals enlargement of the extraocular muscle belly. The tendinous insertion of the extraocular muscle at the globe is not thickened, which is characteristic of thyroid-related orbitopathy. A-scan ultrasonogram reveals medium to high internal reflectivity of the extraocular muscle belly. The primary limitations of orbital ultrasonography are lack of visualization of the bony orbital architecture and inability to image the orbital apex. CT scanning provides excellent studies; however, radiation exposure limits their use for serial examinations. MRI can assess the amount of fat within the orbit as well as the presence of active inflammation with STIR sequences, but CT scans provide better views of the bony anatomy. 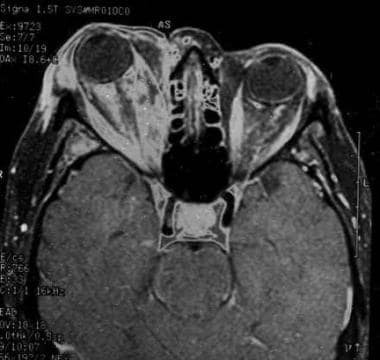 Orbital myositis (inflammatory pseudotumor of the orbit), cavernous sinus thrombosis, histiocytosis X, lacrimal gland tumor, orbital varices, cavernous hemangioma of the orbit should also be considered. Other concerns include (1) failure to perform orbital ultrasonography, with particular attention to internal reflectivity, which may aid in differentiating metastatic disease and thyroid ophthalmopathy; (2) failure to consider biopsy when findings are suggestive of metastatic disease; and (3) isolated metastasis to the extraocular muscle, which may cause enlargement of the extraocular muscle. Additionally, failure to make the diagnosis in a timely manner may result in medicolegal claims against the radiologist. Conventional radiographs are not useful in the diagnosis of thyroid ophthalmopathy, because bony abnormalities usually are not associated with the disease. The degree of confidence is poor. Radiographs cannot determine the amount of extraocular muscle enlargement, degree of optic nerve compression, or presence of other orbital processes that may mimic thyroid ophthalmopathy. Perform orbital ultrasonography, CT scanning, or MRI instead. CT scanning provides excellent visualization of the extraocular muscles and intraconal fat, as well as the orbital apex. Enlargement of the muscles occurs almost uniformly within the muscle belly (as shown in the first 2 images below), and thickening is usually greater than 4 mm. The tendinous insertion (which is easily visualized in axial sections) is usually not enlarged. Pay particular attention to the orbital apex to assess for evidence of optic nerve compression, which is identified more readily in coronal sectioning of the orbit. The degree of globe proptosis relative to the lateral orbital rim can be measured with CT scan studies. 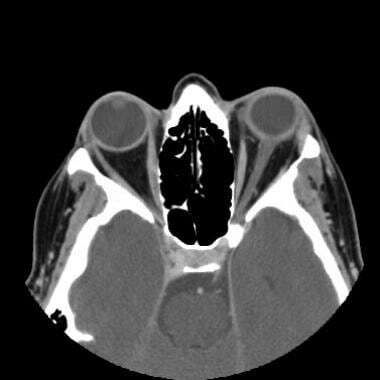 In addition, scans of the bony architecture of the orbit and adjacent sinuses are available when an orbital decompression is required. Prominent intraconal fat can also result in proptosis (see the third image below). The degree of confidence is high. An additional test rarely is required for the diagnosis of thyroid ophthalmopathy. Orbital ultrasonography can also provide the diagnosis with a high degree of confidence, and cost and convenience considerations make ultrasonography more useful when serial imaging is required. Orbital myositis often can mimic the clinical appearance of thyroid ophthalmopathy. This condition is most often unilateral, and the tendinous insertions of the extraocular muscles are also enlarged. 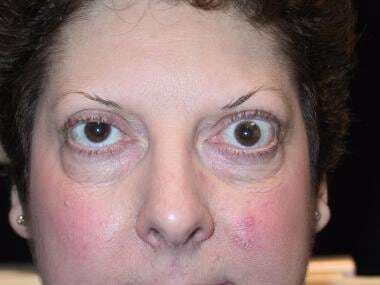 Metastatic tumors to the extraocular muscles may also mimic thyroid eye disease, although these lesions are usually associated with other orbital and bony metastases. However, other etiologies should be considered in the presence of isolated lateral rectus muscle enlargement, because this is almost never seen in thyroid orbitopathy. Similar to CT scan studies, MRI also provides excellent imaging of the extraocular muscles, their insertions, and the anatomy of the orbital apex. The amount of fat within the orbit and imaging of the optic nerve can also be assessed and localized on MRI better than on CT scans. [6, 7, 8] The MRI signal intensity of the enlarged extraocular muscles is usually isointense on T1-weighted images and isointense to minimally hyperintense on T2-weighted images. High intensity in the extraocular muscle on T1-weighted images is occasionally seen, which is consistent with fatty infiltration. This finding can aid in differentiating thyroid orbitopathy from pseudotumor. Short tau inversion recovery (STIR)–sequence MRI has been reported to strongly correlate with active orbital inflammation and clinical activity scores of thyroid orbitopathy severity. 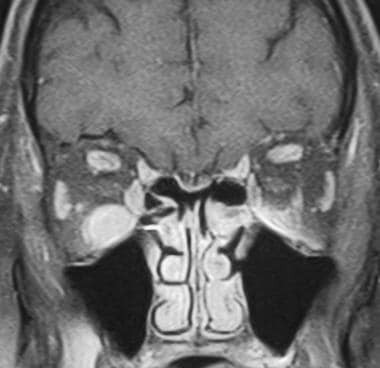 The ability to identify patients with active orbital inflammation makes STIR-sequence MRI a preferred imaging technique for thyroid eye disease. Because of the significant amount of fat present within the orbit, fat-suppression techniques are utilized in its evaluation, particularly if MRI contrast agents are administered. Fat normally appears bright on both T1-weighted and fast T2-weighted pulse sequences; however, fat suppression significantly reduces the signal from fat, thereby rendering it dark on MRIs. This greatly improves lesion detection by increasing the contrast between the orbital fat and pathologic processes. With MRI contrast administration, enhancing lesions become much more conspicuous with fat suppression during T1-weighted imaging. Likewise, in evaluating tumor or inflammatory processes with higher water content, these abnormalities become easily visible with fat suppression during fast T2-weighted sequences. 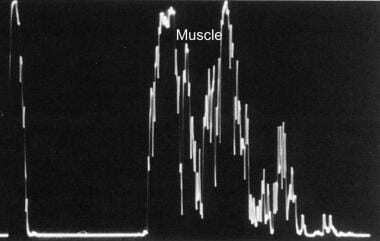 Increased T2 signal in the extraocular muscles is likely caused by increased water content. Patients with elevated T2 relaxation times have increased response to anti-inflammatory treatment (this is similar to octreotide accumulation. See Nuclear Medicine). The degree of confidence is high. Similar to CT scanning, MRI can usually provide the diagnosis of thyroid ophthalmopathy with or without optic nerve compression. Additional testing is usually not required if an MRI study already has been obtained. 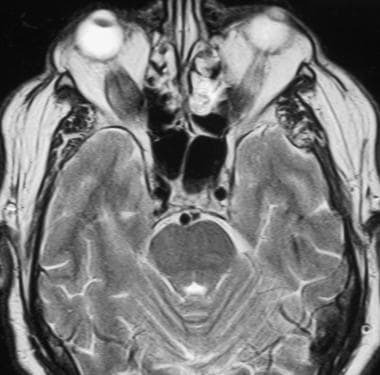 MRI may be better than CT scanning in identifying other causes of proptosis, such as orbital tumors. Orbital ultrasonography is very good for the diagnosis of thyroid ophthalmopathy, and characteristic findings are medium to high internal reflectivity of the extraocular muscles as well as enlargement of the muscle belly (see the following images). The tendinous insertion of the extraocular muscle can also be visualized easily. The degree of confidence is high. Additional examinations to diagnose thyroid ophthalmopathy are not needed if the characteristic high reflectivity and enlargement of the extraocular muscles with sparing of the tendinous insertion are present on ultrasonograms. However, to better visualize the apex of the orbit for evidence of optic nerve compression, CT scanning or MRI may be required if warranted by the clinical presentation. 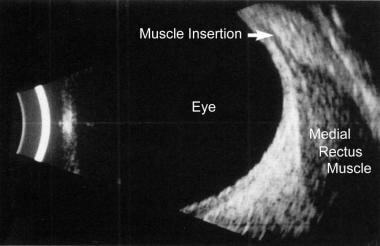 Orbital myositis is characterized by high reflectivity and enlarged extraocular muscle bellies when examined with ultrasonography. 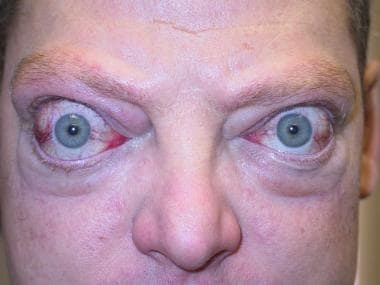 However, in orbital myositis, the tendinous insertion is enlarged, which differentiates this condition from thyroid ophthalmopathy. Although not clinically useful in the diagnosis of thyroid ophthalmopathy, functional studies such as positron emission tomography (PET) scans or somatostatin-receptor scintigraphy (SRS) may assess disease activity. Orbital infiltration with mononuclear cells in thyroid ophthalmopathy can be identified by receptor imaging with octreotide, a radiolabeled somatostatin analogue. Patients with thyroid ophthalmopathy often present when their disease is no longer active. PET scans or SRS in these patients is not informative, and alternative imaging methods (ultrasonography or CT scanning) are required. Other orbital inflammatory processes may also result in increased uptake during functional imaging. Angiography is not typically used in the diagnosis or management of thyroid ophthalmopathy. If this study is obtained, enlarged orbital vessels with increased blood-flow velocities may be present. Abbouda A, Trimboli P, Bruscolini A. A mild Grave's ophthalmopathy during pregnancy. Semin Ophthalmol. 2014 Jan. 29 (1):8-10. [Medline]. Schiff BA, McMullen CP, Farinhas J, Jackman AH, Hagiwara M, McKellop J, et al. Use of computed tomography to assess volume change after endoscopic orbital decompression for Graves' ophthalmopathy. Am J Otolaryngol. 2015 Nov-Dec. 36 (6):729-35. [Medline]. Politi LS, Godi C, Cammarata G, Ambrosi A, Iadanza A, Lanzi R, et al. Magnetic resonance imaging with diffusion-weighted imaging in the evaluation of thyroid-associated orbitopathy: getting below the tip of the iceberg. Eur Radiol. 2014 May. 24 (5):1118-26. [Medline]. Bingham CM, Harris MA, Realini T, Nguyen J, Hogg JP, Sivak-Callcott JA. Calculated computed tomography volumes of lacrimal glands and comparison to clinical findings in patients with thyroid eye disease. Ophthal Plast Reconstr Surg. 2014 Mar-Apr. 30 (2):116-8. [Medline]. Müller-Forell W, Kahaly GJ. Neuroimaging of Graves' orbitopathy. Best Pract Res Clin Endocrinol Metab. 2012 Jun. 26 (3):259-71. [Medline]. Mayer EJ, Fox DL, Herdman G, Hsuan J, Kabala J, Goddard P. Signal intensity, clinical activity and cross-sectional areas on MRI scans in thyroid eye disease. Eur J Radiol. 2005 Oct. 56(1):20-4. [Medline]. Taoka T, Sakamoto M, Nakagawa H, Fukusumi A, Iwasaki S, Taoka K. Evaluation of extraocular muscles using dynamic contrast enhanced MRI in patients with chronic thyroid orbitopathy. J Comput Assist Tomogr. 2005 Jan-Feb. 29(1):115-20. [Medline]. Dodds NI, Atcha AW, Birchall D, Jackson A. Use of high-resolution MRI of the optic nerve in Graves' ophthalmopathy. Br J Radiol. 2009 Jul. 82(979):541-4. [Medline]. Volpe NJ, Sbarbaro JA, Gendron Livingston K, Galetta SL, Liu GT, Balcer LJ. Occult thyroid eye disease in patients with unexplained ocular misalignment identified by standardized orbital echography. Am J Ophthalmol. 2006 Jul. 142(1):75-81. [Medline]. Kuo PH, Monchamp T, Deol P. Imaging of inflammation in Graves' ophthalmopathy by positron emission tomography/computed tomography. Thyroid. 2006 Apr. 16(4):419-20. [Medline]. Kuriyan AE, Phipps RP, Feldon SE. The eye and thyroid disease. Curr Opin Ophthalmol. 2008 Nov. 19(6):499-506. [Medline]. [Full Text].